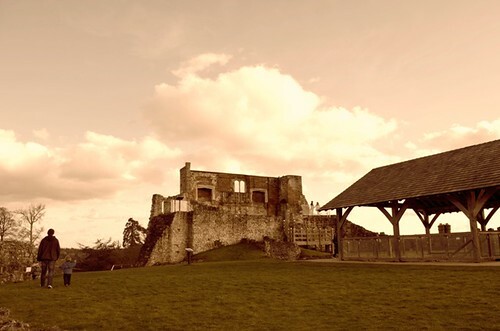 Farnham Castle, a photo by PhotoPuddle on Flickr. I said I would show you some photos that I took over half term. Well it turns out I didn't really take a lot that I can share with you here. I just have lots of pictures of my children's smiley faces and unfortunately I don't do faces here. A shame for the blog but good for me that I have lots of lovely pictures of my son and daughter. They have their moments of course but they are such happy children. And that's just the way childhood should be. Here is a photo I can share with you. It's Farnham Castle in Surrey. It was so sunny and spring like on Saturday we just had to get out and do something outside. We chose to visit Farnham as we'd not been there for years. I hope you like how edited this image. And can you spot a certain husband and son of mine off for a stroll around the grounds? Somehow I've missed adding your blog to my "follow" list! In the transition between Google reader and Bloglovin', I "lost" a few blogs. I've added you back now.